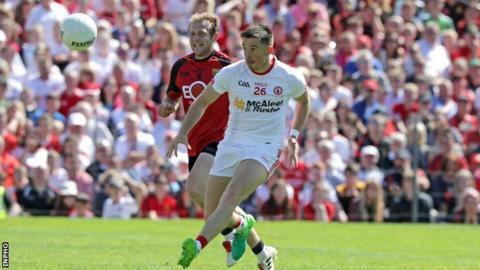 Tyrone forward Ronan O'Neill has quit the Red Hands panel citing a lack of game time. The 26-year-old did not feature at all during Tyrone's recent league campaign. The highly-rated Omagh St Enda's clubman was regarded as one of the brightest attacking talents in the country when he broke into the senior squad in 2012. O'Neill, goalscorer in the 2017 Ulster Championship final, has not ruled out a return to the squad in the future. "I had to think what was right for me," he told the Irish News. "I was sitting about being pat of the squad but not making much of an impact and I wasn't really happy doing what I was doing." Having played an instrumental role in Tyrone's minors clinching the All-Ireland in 2010, O'Neill has struggled to nail down a starting berth in the senior set-up despite several impressive performances from the bench.